I spent last night and a bit of this morning painting this for my mom, for mommy's day. 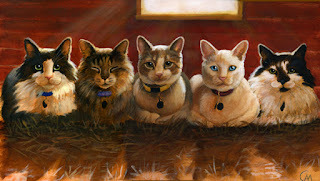 It is of our five family cats (Nemo, Gia, Ollie, Jimmy, And Moo-Moo) a.k.a. her other five children. I love it when our cats do that silly "chicken" pose, so I decided to line them up and put them in a chicken coup-like environment. I'm posting this not because I want a critique but just because it's new and it's art and I'm just glad I did something. And honestly, it made me happy to make this for my mom, because there was absolutely no pressure. Yes, I wanted her to like it, but she's my number one supporter and just about any art from her daughter is appreciated. And I'm proud to say it made her very happy... So here it is, I give you: "Rulers of the Roost." Adorable... I have three cats... makes me want to get a painting of my three :-) Love it!